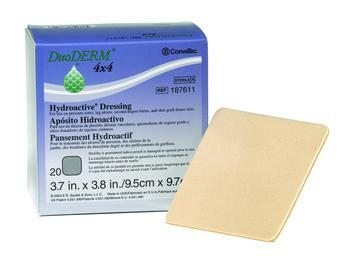 DuoDERM CGF dressing is a hydrocolloid, moisture-retentive wound dressing used for partial and full-thickness wounds with exudate. 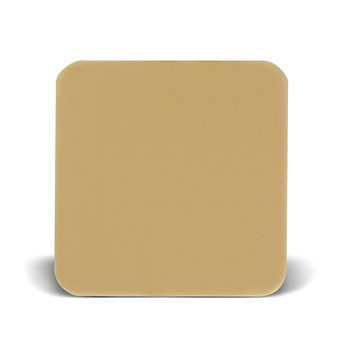 It incorporates a unique ConvaTec hydrocolloid formulation that distinguishes it from other hydrocolloid dressings. DuoDERM CGF dressing is indicated for use on dermal ulcers including full-thickness wounds, pressure ulcers (Stage II-IV), leg ulcers, superficial wounds, partial thickness burns and donor sites. Before using the dressing, clean the wound area with a wound cleansing agent or normal saline and dry the surrounding skin. The size of the dressing to be applied to the wound should extend at least 1 1/4 inch (3.2 cm) beyond the edges of the wound. Remove the release paper from the back of the dressing being careful to minimize finger contact with the adhesive surface. Hold the dressing over the wound and line up the center of the dressing with the center of the wound. Gently roll the dressing into place over the wound. 4. Mold the dressing into place with your hand. NOTE: The dressing should be inspected frequently for leakage and bunch- ing/rolling up of edges. If any of these occur, the dressing should be changed. As wound fluid is absorbed by the dressing, gel formation may be visible on the outer surface of the dressing.